Michael Rowland was born in Vancouver and raised in the North of England. 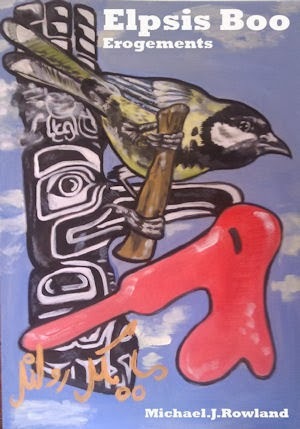 At the age of 19, he returned to his Canadian roots, seeking and finding inspiration in native American art forms and the vast Canadian landscapes. Through literature and painting, he attempts to deconstruct the damaging and manipulative elements of a world hell-bent on producing human beings who resemble nothing more than drones. Michael is an artist, playwright, musician and novelist. He has written three novels, two musical plays and performs regularly in a three piece band called The Bill Murrays. He has had numerous exhibitions of his paintings around The Czech Republic and Ireland. His Dadaist novel Elpsis Boo is an adult's attempt to emulate god/nature's 'joined up' writing; an attempt to return to the here and now and to his own playful, unquestioning, time traveling self. 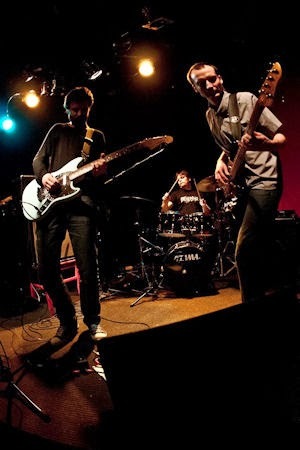 Povetron (Czech for "shooting star") is a Prague-based indie rock band whose roots go back all the way to 2002 when it started as a semi-acoustic songwriter's duo. After multiple line-up changes and other twists and turns, the band now has the classic three-piece lineup with Lukas Holoubek on the bass, Jan Martinek on the drums and Jakub Mihalik on the guitar and vocals. The sound is occasionally enriched by guest-appearances of Alžbeta Tesitelova on the cello. Povetron self-released its debut album "Apples & Oranges" in 2010 which was followed by the "Stories" EP two years later. Povetron puts a lot of emphasis on melodies and lyrics and cites The Byrds, Big Star, Talking Heads, Devo, The Replacements and Dinosaur jr as its influences.